DS-2109 Pro DIGIEVER NVR is a true PC-less and 2-bay standalone NVR. It gives a complete network surveillance system with not only remote monitoring but also local display with 1080p Full HD up to 200fps outstanding monitoring performance. DS-2109 Pro is a 2-bay Linux-embedded standalone NVR, powered by high performance Intel CPU and performs excellent network surveillance of multiple IP cameras up to 9 channels of single server and up to 144 channels of multiple servers. DIGIEVER NVR supports local display of Full HD quality, remote monitoring, megapixel recording and playback. The monitoring demands can be satisfied anywhere and anytime by local display monitoring, remote web browser monitoring, iOS and Android mobile monitoring. With intuitive Quick Configuration, users can finish trouble free installation in only five steps in local display or web-based interface of multiple browsers. The Linux-embedded NVR supports schedule recording, automatic recovery, threshold of recorded videos, and video clip. Through event management, DIGIEVER NVR lets user set diversified events and actions for instant alert. In terms of security control, user privilege management and log system offer user detailed information for security control. All these essential features can be configured quickly in DIGIEVER NVR local display and web-based interface. DS-2109 Pro offers 1/4/9/12/16/20/25/30/36 & 5+1-channel & sequential and full screen display modes. DIGIEVER NVR supports video output via HDMI and DVI-I connectors for high image quality local display. Users can simultaneously monitor up to 9channels in 1920 x 1080 (Full HD) and up to 200 fps (frame rate per second) outstanding monitoring performance. Users can connect speaker and microphone to NVR through USB type external audio sound adapter to verbally communicate with people around cameras. Also, users can control the pan, tilt and optical zoom of IP camera in local display interface. Both monitoring and configuration can be accessed in local display. DIGIEVER NVR lets users monitor remotely via five main browsers in Windows, including IE, Chrome, Firefox, Safari and Opera browser. In web-based interface, DS-2125 Pro offers 1/4/8/9/10/12/16/20/25/30/36/42/49/56/64 & 5+1/12+1 channel & sequential and full screen display modes and supports up to 9 channels. DIGIEVER NVR can be a mini-CMS server to connect other DIGIEVER NVR and select a maximum of 144 channels as well as simultaneously monitor other remote NVR sites without installing any extra VMS software. Also, remote monitoring offers control of PTZ camera and lets users view all preset positions of the IP camera. DIGIEVER NVR can support up to 13 types of action to inform users at the very first time and to mininize event lose and damage when an event is triggered. DIGIEVER NVR lets users search the recorded video by selecting date, time, channel number, normal record, event and recovered file. Users can select display modes with more flexibility from 1/4/9/16 for playback to have an intuitive checking on recording file. Frame by frame playback and rewind features help users to locate needed video image.DIGIEVER NVR allows users to export video files in AVI format by specifying start time and end time to do quick export. Instant Export makes users export maximum 16-channel videos while playing recoded videos.During playback users can also take a snapshot and save photo in PC. DIGIEVER NVR is powered by Intel CPU for excellent megapixel recording and provides network throughput up to 360Mbps. DIGIEVER NVR also supports each hard disk drive up to 6TB. Through DIGIEVER NVR, users can configure Single,JBOD,RAID0 and RAID1 in local display or web-based interface. DIGIEVER NVR will also automatically recover when power resumes after an outage and recover missing file caused from power outage. Users can register a domain name from a dynamic DNS (DDNS) provider and enable DDNS in DIGIEVER NVR. DIGIEVER NVR supports NTP (Network Time Protocol) by selecting time zone for synchronizing the date and time. Users can set either static IP or DHCP on DIGIEVER NVR. With no need of router connection, DIGIEVER NVR supports built-in DHCP server to assign local IP addresses to other device in a local area network (LAN), which makes installation become much easier. For users with higher security concern, DIGIEVER NVR supports HTTPS to enhance security of network communication. Besides, users can quicky add IP cameras via quick UPnP search in LAN. 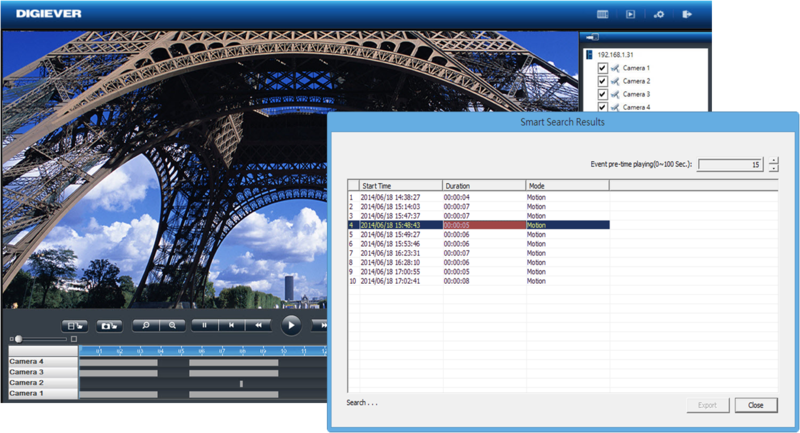 With Windows networking and FTP service, DIGIEVER NVR allows users quickly access the video files. - Fotografiile NVR Digiver DS-2109Pro au caracter de prezentare si pot contine accesorii ce nu sunt incluse in pachetul standard al acesteia. Specificatiile tehnice ale acestui produs, sunt informative, putand fi schimbate fara instiintare prealabila sau pot conţine erori de operare, neconstituind obligativitate contractuala. Nuuo NVRmini2 IP Recorder 16 canale video IP, contine softul IP NUUO, inregistrare H264, MJPEG, MPEG4. Accepta 4 HDD SATA II, 2 USB.